Modern cabbages in the genus Brassica are descended from leafy wild mustard plants native to the Mediterranean seacoast. Used both for eating and edible ornamental landscaping, cabbages are usually classified as either regular head cabbage (B. oleracea var capitate) or Chinese, sometimes called Napa, cabbage (B. campestris var. pekinensis). Both consist of leaves layered one upon another to form a ball. While head cabbages are usually quite compact and round, Napa cabbages are typically looser and may be either cylindrical or round, resembling a tighter head of romaine lettuce. Cultivated for centuries in China, the plant’s popularity across Europe may be attributable to the Celts, who brought the plant back from invasions into Asia Minor, eventually passing it on to the conquering Romans. The Romans spread cabbage farther although it wasn’t introduced to America until much later when Europeans and colonists brought it to the New World. Napa cabbage has a milder taste than regular green head cabbage and is often used for soups, pickling, stir fry, or egg rolls. Head cabbage is used in a variety of dishes like coleslaw and sauerkraut and has become one of the world’s most popular vegetables particularly in Russia, Poland, and Germany. References: Cornell University, Texas A&M Agrilife Extension Website, UC Davis Postharvest Technology Center, University of Arizona College of Agriculture and Life Sciences, University of Florida/IFAS Extension, Western Growers Association. About 45% of cabbage is used in processing to make coleslaw. Fresh cabbage sold by the head makes up more than a third of the market, followed by sauerkraut and other uses. While there are hundreds of cabbage varieties, the four primary types are green, red, Savoy, and Tuscan. Green cabbage includes both regular head cabbage and Chinese or Napa cabbage types including a variety of Asian cabbages. With smooth, dark to pale green outer leaves, the inner leaves of green cabbage tend to be white. Green head cabbage can be classified as Danish, domestic, or pointed. Danish heads are round, solid, and compact. Domestic are also round, but the leaves are less compact and grow a looser head. Pointed are smaller and more conical in both leaves and the overall head. Asian green cabbage types are harder to pin down as various regions and markets name them differently. Most types include the word “choy,” which is a generic word for vegetable. These Chinese cabbages include bok choy, choy sum, gai choy, and Napa cabbage. Red cabbage differs from green mostly in its red to purple outer leaves that are streaked with white on the inside. It has a flavor similar to that of green cabbage, but leaves may have a tougher texture and are higher in Vitamin C. Savoy cabbage is distinguished by its attractive crinkled leaves and mild flavor. Savoy is commonly used for coleslaw and salads. Leaves are yellow-green and the head is not as compact as other cabbage types. Tuscan cabbage is somewhat new to the United States and may be harder to find. Its dark green, white-ribbed leaves have a mild flavor and heads tend to be longer and narrower than other cabbage types. References: Agricultural Marketing Resource Center, Cornell University, University of California Berkeley, University of Illinois Extension. Pests of concern for cabbage are mites, diamondback moths, loopers, aphids, root maggots, beet armyworms, webworms, cutworms, mole crickets, silverleaf whiteflies, flea beetles, slugs, and nematodes. Diseases common to cabbage are black rot, downy mildew, alternaria leaf spot, damping-off, turnip mosaic, wirestem, cabbage yellows, clubroot, purple blotch, yellow or fusarium wilt, watery soft rot, and gray mold. References: Cornell University, UC Davis Postharvest Technology Center, University of Florida/IFAS Extension, University of Illinois Extension. Cabbage is a cool-weather crop requiring consistently moist, well-drained soil with a pH from 6 to 7.5 that is high in organic matter. Cabbage plants can germinate in soil as cool as 40°F. Crops grow best in full sun, but may need moderate shade in hotter temperatures, although shade will slow plant maturity. Crops can be direct-seeded or transplanted. Plantings are arranged in rows spaced 24 to 40 inches apart with 9 to 24 inches between plants. Closer spacing produces smaller cabbage heads. In general, early season plant varieties produce 1 to 3 pound cabbages and late varieties produce 4 to 8 pound cabbages. Hardened plants are successful even in light frost conditions, but heavy freezes can damage the inner leaves of the head even when outer leaves show no sign of damage. Plants mature to about one to 2 feet high with a spread between 1.5 to 3 feet with a shallow root system. Harvest can occur any time after heads form. Heads are ready to pick when they feel solid and compact, only slightly yielding when squeezed. It is important to harvest soon after maturity as sudden soaking rains can cause the head to split. After the main heads have been harvested, a crop of cabbage sprouts can be harvested later from the cut stems. Cabbage is usually hand-harvested and packed unwashed either in bags destined for pallets or in cartons or crates in the field. Heads are easily bruised and must be handled carefully and not over-trimmed of outer leaves. Over trimming will result in a higher incidence of wilted inner leaves, and bruising or cuts leave heads vulnerable to disease. Picking during the coolest part of the day is ideal to minimize damage. When cooling is cost-effective, cabbage is usually room cooled and stored at 32°F from 3 weeks to 6 months, depending on the cultivar. Chinese cabbage is slightly hardier at the lower end, generally lasting from 2 to 6 months. To prevent freezing injury, round cabbage should be kept no cooler than 30.4°F and Chinese cabbage no cooler than 31°F with 90 to 95% relative humidity. Cabbages are sensitive to ethylene and should be stored in a well-ventilated area to avoid spoilage. Cabbage is graded as U.S. No. 1 and U.S. Commercial: U.S. No. 1 consists of heads of one variety with reasonable solidity, no withering or puffiness, and free from soft rot, seed stems, discoloration, and damage from disease, insects, and freezing or mechanical injury. Stems should not extend more than half an inch beyond outermost leaves. Heads should be well trimmed unless U.S. No. 1 Green or New Red, which are fairly well trimmed. For U.S. Commercial cabbage, heads be reasonably firm and well-trimmed unless classified as U.S. Commercial Green or New Red, which requires fairly good coloring and trimming. Generally speaking, the percentage of defects shown on a timely government inspection certificate should not exceed the percentage of allowable defects, provided: (1) transportation conditions were normal; (2) the U.S. Department of Agriculture (USDA) or Canadian Food Inspection Agency (CFIA) inspection was timely; and (3) the entire lot was inspected. Canadian good arrival guidelines (unless otherwise noted) are broken down into five parts as follows: maximum percentage of defects, maximum percentage of permanent defects, maximum percentage for any single permanent defect, maximum percentage for any single condition defect, and maximum for decay. Canadian destination guidelines are 15-10-5-10-4. There are two U.S. grades for cabbage: U.S. No. 1 and U.S. Commercial. • As sunscald progresses, the affected area begins to dry out and the result is a bleached, papery, or parchment-like area surrounded by healthy tissue—score as damage when the affected area exceeds more than 25% of the crown area or penetrates more than 2 head leaves. 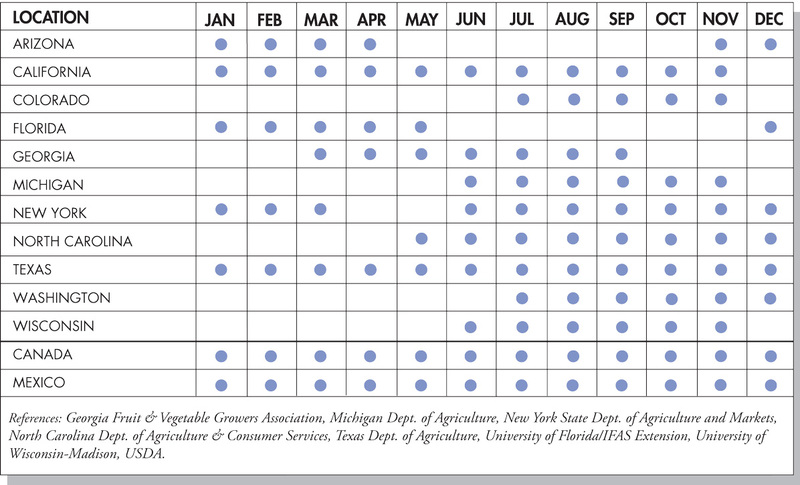 Source: Tom Yawman, International Produce Training, www.ipt.us.com.